While the Mets’ 2017 season has basically just been one endless descent in the standings, the one argument constantly raised in favor of the Mets still having a chance has been the much-maligned Nationals’ bullpen, which has been the anchor holding the team down, and the only reason they’re still in the same galaxy as the Mets, Marlins, and Braves in the standings. But the obvious counter-argument to that is that, for as bad as Washington’s bullpen has been, the Mets’ second-best non-specialist reliever is literally Paul Sewald. Which is to say, the Mets bullpen is almost as bad. What’s more, the Nationals have the team around them to overcome a leaky bullpen, whereas the Mets do not. And last night, we saw the actual embodiment of that argument/counter-arugument exchange played out in front us. Yes, the Mets bullpen is bad. With the game tied at 0-0, an obviously overworked Jerry Blevins—who, even with more sporadic appearances lately, still leads the majors with 43 games pitched—came into the game in the eighth inning, and allowed a walk and a two-run homer to Michael A. Taylor. However, the Nationals bullpen is still worse than the Mets’. Sammy Solis, the Nats’ de facto closer who won the job immediately upon his return from the DL by simply not being any other reliever on the Nats, blew his first save attempt of the season in the ninth inning. 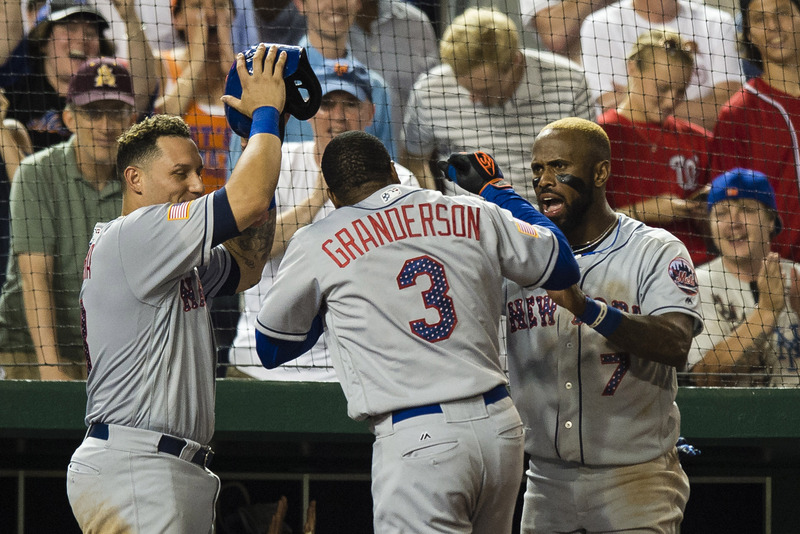 Curtis Granderson came up as the tying run with two outs and got down 0-2 in the count, but blasted a clutch, game-tying homer that appeared to send Bryce Harper into a very dark place. But the Nationals still have the skill to overcome their woeful bullpen, whereas the Mets do not. Sewald began the bottom of the ninth inning, walked a batter and got an out, and gave way to Josh Edgin, who followed suit. Then Fernando Salas came in, and it only took two pitches for Ryan Raburn to end the game. Raburn dropped a walk-off single in front of a sliding Yoenis Cespedes, who also apparently cramped up on the play, because of course he did. There are two more games to go in this series, but hopefully Mets’ upper management has realized by now that they’re not nearly on the level of Washington and will not catch them nor even put up a fight, and the Nats’ poor bullpen isn’t enough to change that. It is imperative for them to sell at the trading deadline and restructure this team for 2018. Of course, both of these bullpens ruined what had been a maginifcent pitcher’s duel between Stephen Strasburg and Steven Matz. Both pitchers matched zeroes for seven innings before being relieved. Strasburg fired seven sparkling innings and only yielded two hits and three walks with six strikeouts. Matz was only slightly less stellar, allowing four hits and two walks while only striking out four in his seven innings. Matz flashed his best velocity of the season, with some pitches coming in the 95-96 mph range. He’s still not getting strikeouts like he used to, and if he’s going to be succesful in front of this defense he will probably need to get those back before long, but his return has been a boon for this entire pitching staff. Starting pitching like this is really fun to watch, and something I’m sure we all wished we saw more of in the first half of this season. On Wednesday, I metioned that the Mets’ starting pitching ERA- was tied for the worst mark in franchise history with the 1963 Mets at 122. But thanks to the exploits of Matz, Jacob deGrom, and Seth Lugo in the past week, that has been lowered to 117, which is now tied with the 2009 Mets. Mike Pelfrey led that team in innings pitched. Also, in This Week In Evidence Of Juiced Baseballs, Michael A. Taylor is now rocking a .238 ISO on the season. This is not a reality I am used to or particularly enjoying. Yoenis Cespedes is not expected to play in today’s game due to his leg cramps suffered last night. Curtis Granderson, however, is playing. Some really serious news here: Las Vegas 51’s pitcher Logan Taylor was diagnosed with a concussion after being attacked by a tire iron during an attempted robbery by a homeless man on Saturday in Salt Lake City. Here’s wishing the best to Taylor. Set your alarms! The Mets play an early morning game on Independence Day in our nation’s captiol. First pitch is (ridiculously) scheduled for 11:05 a.m. Seth Lugo takes on Joe Ross, and I can only imagine how much caffeine is necessary to pitch a baseball game at 11 in the morning. “hopefully Mets’ upper management has realized by now that they’re not nearly on the level of Washington” from your keyboard to Sandy’s ear. Also, Matz won’t need more strikeouts if the Mets promote Rosario soon.